Small birds have always been popular as pets, but in recent years one specific type has seen an astronomical rise in popularity. We're speaking, of course, about the charming and captivating Parrotlet. Highly intelligent, affectionate, and undeniably cute, these little birds have been diligently working their way into the homes and hearts of bird lovers around the world. They form strong bonds with their owners and make excellent pets when properly raised and tamed. Check out the information below for a few key facts about these adorable birds―you may decide that you are interested in welcoming a Parrotlet of your own into your family. While they are very small birds, some Parrotlets can learn to talk and some develop rather impressive vocabularies for a bird of their size. While it isn't a guarantee that a Parrotlet will do anything beyond a chirp or screech, it never hurts to try to teach them. A word of caution, however―the only way to be absolutely sure that you are getting a bird that will talk is to adopt a bird that already knows how to talk―so please don't rush out and adopt a Parrotlet expecting it to be a little chatterbox. That's right, these tiny little birds are indeed parrots―in fact, Parrotlets are the smallest birds in the parrot family, even smaller than Budgies! 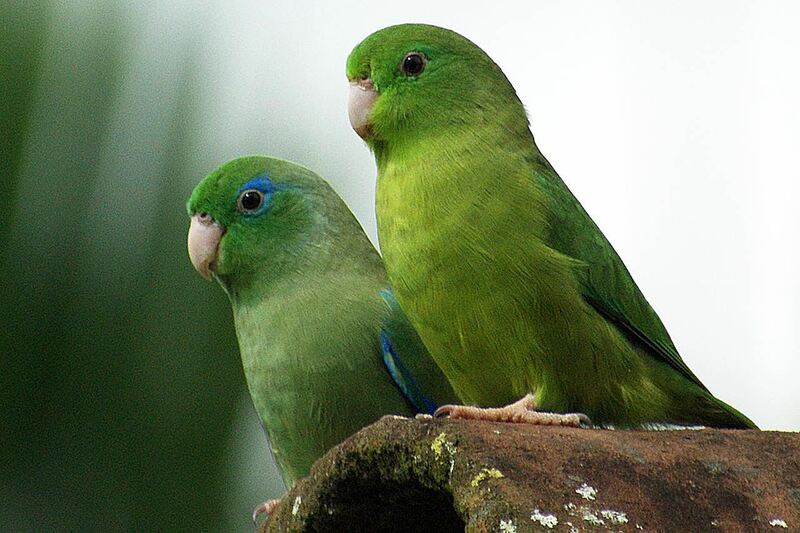 It might come as a surprise to many, but the Parrotlet's closest relative is actually the large and impressive Amazon Parrot, which may account for many of the behavioral traits these little birds exhibit. They also resemble their larger cousins closely in the looks department, which is why many people affectionately refer to them as "Pocket Parrots." They might be small birds, but Parrotlets can live for a very long time. On average, a Parrotlet that is well taken care of lives for up to 20 years, but many have lived on even into their 30's. For this reason, it is very important that those who are interested in adopting a Parrotlet be sure that they are willing and able to commit a lot of time to care for them. These are pets that will be around for a very long time if things go well, so their owners should be prepared to care for them for many years. Parrotlets have big personalities and don't let their size get in the way when it comes to playing and interacting with their owners and other birds. Those who keep pet Parrotlets often report that they have feisty, sassy personalities that seem too big for their little bodies. It is important that those who own Parrotlets take the time to handle them every day and provide them with plenty of ways to entertain themselves. Otherwise, the birds may become bored and resort to destructive behaviors. Proper training from the very beginning will help to shape a Parrotlet into a loving and well-behaved pet. Parrotlets are extremely active birds in the wild, spending countless hours each day flying, foraging for food, and staying clear of predators. In captivity, their owners need to do what they can to give them as much exercise as they would receive if they were wild birds. While this sounds challenging, there are lots of creative ways to give pet birds exercise, including fun activities that you can do together to get your bird moving while increasing your bond at the same time. In addition, to exercise, Parrotlets need lots of social interaction with their owners in order to thrive in captivity―so those interested in adopting one should make sure that they can devote 3 to 4 hours per day to spending time playing with their bird.